TENORI-ON is an electronic musical instrument that consists of 16 by 16 LED switches. It was first showed off at SIGGRAPH 2005 held in Los Angeles. For me, an interesting point is that the LED switches seem to sense human touch. Compare TENORI-ON with a LED touch display from NYU. What's next? Well, probably two things taken from gaming consoles - sensitivity to direction of motion for the unit as a whole (think of the Nintendo Wii), and something called haptics. Haptics is all about the study of touch. Integrating haptic technology within a touch screen could enable phones and other devices to allow us to experience a whole new set of senses. nanoTouch is a kind of back-of-device touch interface especially designed for very small devices (2.4" or less). Compare it with its predecessor lucidTouch and others such as Grippity. One more advantage of nanoTouch the authors missed is that touching the back side of a small device is much more comfortable than touching that of a larger one. P. Baudisch and G. Chu, "Back-of-Device Interaction Allows Creating Very Small Touch Devices," submitted to CHI2009, Boston, MS, April 4-9, 2009. Placing the Nanotouch on the right hand thumb, as the user massages their index finger with their thumb "Nanotouch" makes the cursor move on the screen. The concept is funny, but no more information I can have. GT students Justin Needham and Mathew Straub built a digitally assisted billiard system with a web cam, an embedded computer and a projector. Microsoft now has one more item for its application list for Surface. Many HCI researchers have been interested in back-typing or rear-side touch. For example, Microsoft introduced LucidTouch that combines a webcam and a multi-touch panel installed on the rear side of a mobile device. Apple filed a patent application claiming a device with force-sensitive back-side interface. Although the interface concept is cute, I had expected that a real product would be in the market at least after 3-4 years until I met Grippity keyboard from an Israeli startup company. The keyboard is composed of a keypad whose mechanical structures are configured on the back of the device and a trackball on its top right corner. It is reported that Neonode is in bankruptcy mode. Neonode's unique touch technology lets the old and popular IR touchscreen technology to be applied to mobile handsets. There is another company that has a mobile version of IR touchscreen technology - RPO. In this post, I compare the features and technologies of those two companies. Due to the rapid advent of multi-touch user interface, so many companies are now providing their own gesture sets. Jonathan Brill posted an interesting article on the need of a standard multi-touch gesture library. Especially, he wants Microsoft to publish a de facto standard gesture library with a community common license. I totally agree with him. But I am not sure if it is possible to make an easy-to-use and remember gesture set without IP violation. For example, Apple has a patent that claims two-finger open- and close-pinch gestures and many other companies also have filed their own multi-touch gestures. I just hope relevant companies well resolve the IP problem for the rest of us not to use clumsy multi-touch gestures. PS: I like PQ Labs gesture set. Their multi-touch gestures seem to be useful to navigate 3D virtual world. It's Sasha Haris-Cronin's summary on various touch screen technologies. You can also get some insights for making your own touch panels. T. Selker, "Touching the future," Communications of the ACM, vol. 51, no. 12, pp. 14-16, Dec. 2008. Abstract: In combination with finger and hand gestures, multitouch input is enabling users to manipulate and display information in innovative and unprecedented ways. 30 min. video clip introducing people, lab, and demos of multi-touch team, MSR Cambridge. HackingCough has a story about QRG's multi-touch touch screen controllers, including an interview with Chris Ard, director of marketing. QRG is UK-based and acquired by Atmel. Julian Lombardi introduces a video of the Cobalt metaverse browser on a large interactive multi-touch screen. It's a helpful resource for touch interaction designers. Bumptop on large touch display. Bumptop on a large touch display (MS Touch Wall). You can also find another version of Bumptop video here, with multitouch. The article also contains interesting descriptions and opinions on Bumptop. BumpTop Touch, Multi-Touch Showcase from Anand Agarawala on Vimeo. CNET does a story about an interview with Lenny Engelhardt, N-trig's VP of Business Development. He said "Seven- to 17-inches is our sweet spot" since screens of smart phones and other small mobile devices are too small to make a good multitouch interface. My opinion is a little different. First, Apple iPhone anyway has shown an excellent way of applying multitouch to small screen devices. Second, I think that N-trig's DuoSense is much more important feature than multi-touch. With DuoSense technology, a user can use pen and multi-touch simultaneously. Pen input is very important feature for Chinese users due to their complex character system (ideogram). So, I slightly modified N-trig's opinion: 1) seven- to 17-inches is a sweet spot of multi-touch and 2) cell-phones and smart phones are a sweet spot for DuoSense. In Arduino forum, you can find discussions on making a capacitive touch sensor with Arduino platform. Arduino is an open source electronics prototyping platform for artists, designers, and many others. Beside touch sensing, Arduino forum has discussions on many interesting hobby projects. The figure below is Pololu 3pi Line Maze Solving Robot. Multitouch Applications from Falcon4ever on Vimeo. Multigesture.net is a multi-touch and multi-gesture research blog by Laurence Muller. He developed a multi-touch system called tDesk. He also obtained MS degree for the multi-touch interface. His master thesis is well organized and covers various aspects of multi-touch systems, from system design to user study. For me, Chapter 3: Multi-touch detection and processing is quite useful to understand the internal data processing of multi-touch systems. If you are to make your own multi-touch gesture software, the thesis is worth while to study. 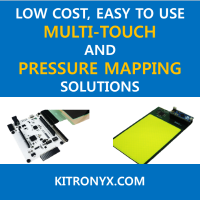 Previously, I posted an article on DIY capacitive touch sensing. Today I found another interesting site - CapToolKit - helpful to make your own capacitive touch sensor. The site is maintained by Raphael Wimmer and contains everything - schematics, firmware, communication protocol, etc., to build capacitive touch sensing applications. Microchip has a new line of touch sensing products called "inductive touch". Let me show their introduction rather than mine. When a user presses the front panel, it deflects slightly. This deflection, on the order of microns, is inductively detected. The fundamental principle of operation is that the impedance of an inductor varies when a nearby magnetically permeable or electrically conductive material moves relative to the inductor. As you shown from the above description and illustration, it's a kind of a pressure sensor while most capacitive touch sensors are categorized as contact sensors. It senses the change of distance between two parallel plates when a user presses down the sensor. In my opinion, the term touch now has three different meanings: contact, pressure, and proximity. There are many ways to construct a pressure sensor using various sensing techniques. The most popular but people are not aware is resistive touch screen. Capacitance sensing technique can also be used to pressure sensors (You can find an example in PPS web site). Here, I have a question. The Microchip's document shows a comparison chart that compares inductive touch and capacitive touch. But I'd like to know differences between capacitive pressure sensing and inductive pressure sensing (inductive touch). There should be some differences, but I couldn't identify since I'm not so familiar with pressure sensing. Does anybody know an answer? This is the web-page of my recent multi-touch software project. It was born from an entry to the well-known german "Jugend forscht" technical & scientific youth-contest. This work won the regional-contest of Unterfranken at March 9, 2007 and next level, the bavarian-contest in Munich at March 29. From May 17. to 20. it could be seen in Hamburg and won the second prize. At CeBIT 2008 the prototype of mehr:wert could be seen at Hall 9, Stand B40. PQWindow Software Platform adds Multi-Touch foundations to various operating systems such as Windows, Mac OS, etc. The package also comes with valuable Mulit-Touch applications to show case innovative human computer interactions. The article describes how to enable multitouch gestures using IBM ThinkPad T30 equipped with a Synaptics TouchPad. The supporting multitouch gestures include 'three-finger swipe' and open- and close-pinch geestures. Momo gives directions to people by haptic feedback. The user holds the device and it tilts and vibrates to give right way to go. momo: a haptic navigation device from kristin on Vimeo. Playing the E-Field: Capacitance Sensors in Action: Very informative. Do people really like multi touch? Who wants multi-touch? I think I just might. touchWorldWind Beta is Available Now! He noted Microsoft's touch interface as an important element in this strategy. What good is multi-touch anyway? Show of hands: Who wants multi-touch on a PC (and why)? Each thumbnail is linked to the original article.